The InstalTest COMBO is a manual multi-function and installation tester, and introduces the new single button "Socket Test" without the need for trailing leads. Watch the 'Test Sockets in Seconds' Training Video! This short training module shows electricians how to test sockets in seconds without cumbersome trailing leads using the Instaltest Combo. The InstalTest Combo simplifies socket compliance testing from 4 tests to a single push button test. Installation testing to AS/NZS3000 and AS/NZS3017 covering earth continuity, insulation resistance, polarity, correct connections, fault loop impedance and RCD tests. 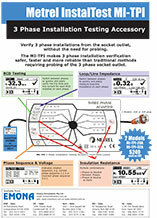 Use MI-TPI accessory for 3 phase installation verification and testing. 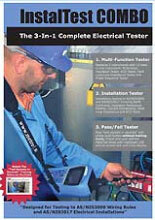 New "test sockets in seconds" with single push button without trailing leads. Preset and user defined Pass/Fail limits with red/green LED and on-screen tick and cross display. 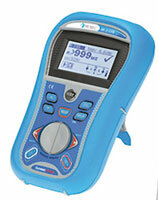 Simultaneously measures voltages between L-N, L-PE and N-PE, phase sequence and frequency. Values are shown in real-time. On 3 phase systems it monitors voltages between phases and phase sequencing. 200 mA continuity test for testing resistance of earth conductors and equipotential bonding. Automatically swaps polarity. Limits can be set by the user, for example, 1ohm and the COMBO indicates a Pass. With test voltages from 50V to 1000V. Measures from 0.01Mohm to 200Mohm. Also displays instrument test voltage. Users can set limits for Pass/Fail indication of results, for example, 1Mohm and the COMBO indicates a Pass. Five RCD testing functions: contact voltage, trip time, trip current, RCD ramp test and AUTO which tests all RCD parameters with one button press. Users can also set test current waveform plus starting polarity. Not sure of the connections for a test ... the COMBO unit is your best friend. Just press the HELP button and on-screen diagrams will help you get the job done right. The InstalTest COMBO introduces the new single button “Socket Test” without the need for trailing leads. The “Socket Test” performs Earth Continuity, Polarity and Correct Connections tests with a single push button and with Pass/Fail indication with a tick or cross and green/red LED indication. COMBO simplifies socket testing by reducing the number of tests required from 4 tests to a single push button test. Two fault loop tests: Z-loop high current loop tests for non RCD protected circuits and Zs-rcd for low current loop tests guaranteed not to trip the RCD. Users can select fuse type, fuse current rating and fuse tripping time. For everyday electrical work, all test leads, test probes and alligator clips are included. For installation verification to AS/NZS3017, a 5ohm & 10ohm resistor box is included for correct connections & polarity.